I jumped into this sandy purchase based on Mark’s recommendation of Pat’s PJ’s Gobbler. I’m the only one to blame here, though; I should have known better than to assume all holiday-inspired sandies are created equal. As follows is a log of my harrowing King Soopers pre-cellophaned sandwich journey. Weird. Not unpleasant, but not great either. Tastes like Thanksgiving’s cousin who means well but doesn’t quite get it. The turkey tastes good as does the cranberry sauce, but it’s more jelly than sauce. I prefer can-shaped, Jell-O-like medallions. Bad. Unpleasantly soggy in parts. 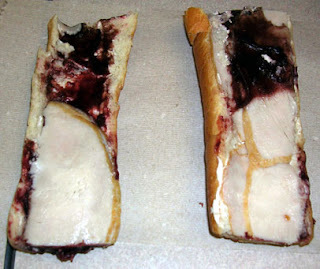 Eventually the cran and mush disappeared and I was left chewing turkey and the drier parts of the bread. After all the smooshy horror, the texture was fine. The cream cheese was unwelcome. I’d suspected that’s what the white splotches squeezing out from betwixt the bread halves were. Pretty much any other cheese would have fared better. Keep in mind that I love cream cheese on burgers (namely, with green chile strips at the Cherry Cricket). Good bread-to-filling ratio. There was just enough bread to keep it all together and provide some flavor, and not so much meat that you felt like you were chomping into the broad side of a huge cooked turkey. Nearing the end of the sandwich, I was getting sick of its sweetness, and not in the how sweet it is sense. More and more I sensed the “cranberry salad” was simply cranberry jelly excessively slathered on the sandy. The last bite, wherein a huge blob of cranberry jelly and cream cheese had accumulated, was hellish. I can’t recommend this sandy to anyone excluding my worst enemies. The flavors weren’t so bad, but this thing was just too squishy, and sandies shan’t be so squishy. As I was the recommender, I will have to whole heartedly disagree with your 1.5 sandwich icon out of 5 sandwich icon rating. You called the taste "weird". I would agree, if by "weird" you mean "unique and adventurous" as this sandwich most definitely is. Sure, anyone can do a BLT, a club, or a croissant-turkey-gouda-cranberry sandwich, those are a dime a dozen, but to create a signature sandwich that is unique and delicious, well sir, that is something. I hesitate to say this, but the "cream cheese" you speak of was actually mayonnaise. I am pretty sure of it, no joke. This may be the reason for the less than raving review. No, by "weird," I meant "surprisingly unpleasant to eat." I will grant you that this sandwich was unique and deserves credit for originality. And it was originally rated 2 sandies, but I couldn't find "2.gif," so I just dropped its score down. I never said my system was fair. And I assure you that was cream cheese and not mayo. I was hoping it was mayo, because that's a good compliment to turkey, but no — cream cheese all the way.